The Angel Tuners™ are based on the ninth octave of the overtone series. Frequencies: C4096 Hz (Earth), 4160 Hz, and 4225 Hz. After meditation or massage, gently tap the angel tuners. You do not have to hold them directly in your ears. Tap them gently three inches to several feet off the cranium and move them around. They can be held in specific areas of sutural restrictions, internal bone rotation, or energy conflict. 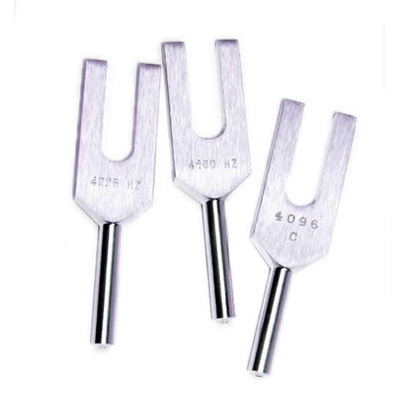 The pulsating beats between the tuning forks will be apparent to the listener’s ears. Most importantly, allow your inner mind to listen to the sound and create new ways of using the Angel Tuners.